KOTA KINABALU: Sahabat Alam Malaysia (Sam) is concerned over the slow progress of investigation into the death of the 14 pygmy elephants at the Gunung Rara Forest Reserve in Sabah in late January. Until today, no results or findings have been released. The authorities have yet to determine whether they were poisoned deliberately, said Sam president S M Mohd Idris. “How long does it take for experts to obtain answers to the death of the elephants?” he asked. Sam calls on the Sabah Tourism, Culture and Environment Minister and Wildlife and Natural Parks Department to release their findings as the public has a right to know the cause of the deaths. “With the threat to wildlife in our forests, what percentage of elephant habitat remains? Even the fate of protected forests remain uncertain as they can be converted into reserves with a large chunk filled with new settlements, villages and agricultural land. 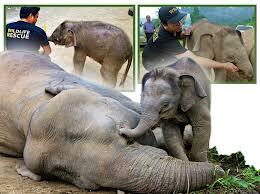 Traditionally such tracts have been routes through which elephants have roamed,” said Idris in a statement yesterday. In the case of oil palm plantations, he said they are often adjacent to wildlife habitat and the only routes available for elephants are through villages and fields of farmers, who bear the brunt of the conflict. With so much land devoted to plantations, the elephants’ natural habitat has shrunk, he said. As a result, an increasing number of elephants are entering newly developed areas and incurring the wrath of plantation companies, farmers and villagers, the consequence of which is death by poisoning, he added. “We hope the authorities are conducting an in-depth investigation to prevent a recurrence. “Efforts to improve the balance between the needs of elephants and an ever-expanding plantation sector, plus a growing human population, have to be taken seriously,” he said. Idris also said there is a need to reduce the level of conflict between human activities and elephants, and enhance community engagement in the conservation of elephants and their habitat. He pointed out that poisoning of elephants is the most cruel form of treatment carried out by those whose only intent is to avenge the loss of crops without understanding that elephants need space to move. “Sam looks forward to the results of the investigation and we call on the authorities to step up their probe into finding those responsible for the death of the elephants, and for them to be penalised,” he added.